Good news for women who want to use power tools and have a spot in the garage (could it be called a girl cave or girl nook?). I have claimed a corner in our garage from the boys and am painting, hammering and drilling to my heart's content. My corner of the garage, my " Girl Nook". What am I making, you ask? I am remaking a lot of stuff actually. I am making prints of my original watercolor paintings and framing them in old frames with new paint to compliment the painting. Plus I am furiously paintings signs, chalkboards, earrings and suitcases as well. Do not get in my way or I will cover you with a fresh coat of paint. The reason I am making up cycled creations is to fill my 3rd of a booth my friends Merrian, the furniture painter and Gayle, the jeweler have rented in the Carlsbad Antique Mall in Carlsbad Village on State Street. We decided it was time to test the retail market with our wares. We are all sensitive and shy artists and hate the thought of marketing our art. However, together we are brave and willing to risk rejection or success or both. Repainted metal suitcase with chalkboard. 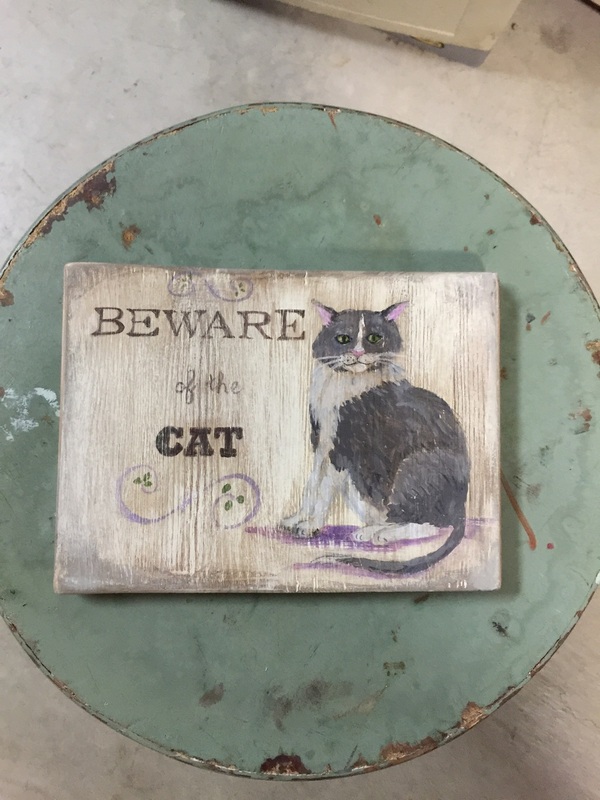 Hand painted cat beware sign on fence wood. Print in old vintage frame.